I’ve been trying to cut down on food waste in my house, and one of the things that goes to waste a lot of the time is the heels and mis-cuts of my homemade bread. You’d think it would get eaten up since it’s fresh and honestly tastes the same as the rest of the loaf, but the kids especially tend to leave it to go stale or even moldy. What I’ve started to do is take the stale ends and whizz it through the food processor to make bread crumbs, which was suggested by Jamie Oliver in this video. (I know it’s an ad, but it had some good tips!) This go around the crumbs were mostly from a loaf of rosemary Bread Machine Fluffy Herb Bread, which is a great herb to combine with chicken. To add a bit more flavour, I broke out the Ikea FALKSALT sampler that my husband got for Christmas. I can’t seem to find a listing for it online, but it comes with four blends of sea salt: natural, wild garlic, oak smoked, and wild garlic. 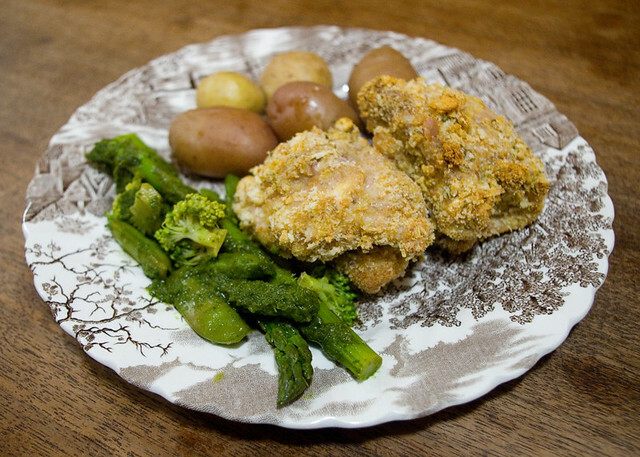 I chose the oak smoked for this dish, so I ground up a bit and added it to the bread crumbs. I dipped the chicken thighs in flour, then beaten eggs, and then bread crumbs. Then I baked it all for about half an hour, until the meat was cooked all the way through but still juicy. To finish the meal, I also boiled up some baby potatoes that I bought over a month ago and had forgotten about in the fridge, and the leftover miso greens from the night before. Truly, this meal was all about avoiding food waste — but it was also delicious! Simple, too.